Some of my favorite names are the rarities that were once in use, but are now fading towards obscurity. Alifair and Ladusky are two. With thanks to Virginia, our Baby Name of the Day is yet another: Paralee. Paralee was given to at least five girls born in the US every year from 1880 through 1958. 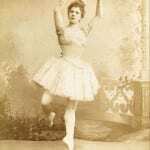 Between 1880 and 1908, the name frequently appeared in the US Top 1000. In 1920, 39 newborn girls were named Paralee. It’s faded since then. While Paralee seems to be most common in the South and the West, it’s too widespread to come from one family tree or local trend. The earliest uses of the name seem to occur in the 1810s, and I think that’s the key. Paralee might a spin on names like Clara and Sarah, with the -lee ending. Except that ends-in-lee wasn’t common for girls’ names until more recent decades. Was it an obscure form of one of the Par- names popular at the time? Parthenia was familiar in the same era. 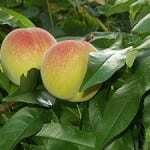 Maybe the -lee is that familiar leah – meadow, and the first syllable refers to pears. But that feels cobbled together. Another name that came to mind was Onnolee, from a legendary Indian princess in New York. She died rather than become a captive of a rival tribe. Onnolee was immortalized in a nineteenth century poem. But it seems like a stretch to connect the two. It’s tempting to link Paralee to Pearl and Pearlie, based on sound, and because genealogical records report several women named Paralee were called Pearlie. Could it be a surname? Parlee and Parilee are both seen as variant spellings. Parlier is recorded as a surname, from the Old French parlier – to speak. If you remember your Pirates of the Caribbean, Elizabeth Swann requests a “parlay” – a talk. This Missouri family tree includes women named both Paralee and Parilee. It’s also sometimes spelled Parolee – could it be a reference to the older sense of the word parole – word of honor, from the French, parole d’honneur? Here’s my theory, and it’s a wild one, sparked by Parolee. During the reign of France’s King Louis XIV, a card came called pharaoh developed. By the 1700s, “pharo” was popular in England. It was a sensation in the US by the early 1800s – the national card game. As early as 1701, the term parloi was used in the French version of the game, to mean “promises.” It came from the Italian word parole, with the same meaning. In English, players would “parlee” a bet. Could it be that Paralee came from the faro term? If it was understood as a word with a positive meaning, it seems possible. And the timing matches perfectly. I even found siblings named Paralee and Faro. 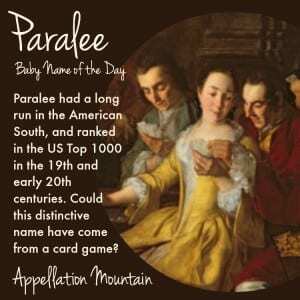 A virtue name from a gambling game or not, what Paralee is today is Southern. William Faulkner used the name for Aleck Sander’s mother in his 1948 story Intruder in the Dust. Let Us Now Praise Famous Men was a collaboration between photographer Waker Evans and writer James Agee. They chronicled the plight of Southern families during the 1930s Dust Bowl era. 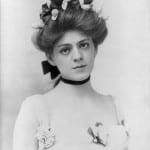 They used pseudonyms for their subjects, including Paralee Ricketts – real name Dora Mae Tengle. Today, Paralee would fit right in with all of the ends-in-lee names for girls. If you’re after a Southern name that your daughter will probably never share, Paralee is a possibility. What do you think of Paralee? Would it wear well in 2015? I’m stunned to find this article. I’ve looked for information for years. I’m caucacian. Lonely but lovely name. After 40 years I recently found and took picture with Para lee- most beautiful black lady 87 yrs young 20 minutes from me. She said, a black lady, age 99, Para lee, lives in biloxi. All I ever found was Para lee on tombstones in several African American cemeteries 1880s-1920s. A famous pilot in France flew with his cat named para. During the invasion of Natchez, a servant in alabama called Mr Parrow, (Payra, Paro) helped save wandering citizens of natchez, according to Pickett’s History of Alabama. Paralee has been passed down thru my family. My maternal grndmothers middle name,my mothers, mine and my youngest daughters as well.I’ve always been told its been given thru out the family for generations. Linda, thank you for sharing! It’s such a fascinating name. My great-grandmother’s name was Paralee, not sure where her parents got it (other than being from the deep south) and I’m not sure how it was intended to be pronounced. 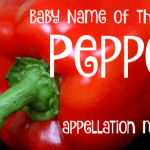 But apparently, my great-grandfather (also from the deep south) pronounced it, “Parlee,” (like parsley without the S) and if any other pronunciation was used, she didn’t insist on one specific version. Interesting – thanks so much, Susan! Thanks for sharing, Kelly – and how great that you’ve kept the name alive! My middle name is Paralee after my paternal grandmother, Martha Paralee. It’s a family name. Many before her had the same middle name. My 4th daughter also shares the middle name. About four years ago my cousin on my dad’s side named their first childs first name Paralee. I never looked up the name origin till today. I have always loved the uniqueness of it and always thought it was a put together name in my family passed down for generations. It’s beautiful. I would prefer it stay as a family name but would love to hear it used more. Only because I have had so many people love the name too. It’s pronounced like pear-a-lee. I always have to help people pronounce it when i was asked my middle name. There’s an Algela [sic] Paralee LN on my family tree who was born in 1868. Interestingly, one of her daughters-in-law was named Callie Donia LN [like Caledonia!]. What fabulous finds! I’m intrigued by split names like Callie Donia – so clever! I like it. The names feels fresh, charming, girly, sweet and really the name doesn’t feel all that obscue, even though it is heading in that direction. I love the idea of Paralee being a nice nod off of Parthenia, even though it isn’t. Parthenia is a family named of mine, although it is spelled Parfena, but Paralee feels less elaborate and more at home in 2015 than the Victorian Parthenia. I hope more expecting parents see this post and feel inspired to use it. It would be a nice suprise to run into a Paralee. 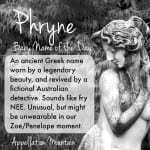 Paralee is the name in my family tree that I’m not quite daring enough to use but still love. It’s a name in my family tree as well. I think it makes a beautiful middle name if u get the right first name. It rolls off the tongue better. Mine is Brenna Paralee and my daughter is Hannah Paralee. If u have children you could always let them know about the name and possibly they would name one of their children with it. I am a bit old fashioned..lol. I love family names. I appreciate its pep and sweetness, but all I hear is “paralegal”!